Nicoya recently hired Jim Harp to serve as their VP of Business Development. Nicoya is looking to fuel the growth of OpenSPR through expanding internationally via channel partners and strategic OEM partners, and needed someone experienced and dedicated to that role. Jim is the perfect fit – a California native with deep industry sales experience and a fondness for KW. In addition, he’s a super cool guy – in his spare time, Jim spends his weekends motocross racing, desert dirt biking, surfing and coaching hockey. We interviewed Jim to get to know him better and get an idea of why he joined Nicoya. Jim has over 20 years of experience in various senior management positions in sales, marketing, and channel development. He has helped scale a number of products and businesses globally by establishing and managing distribution partners and strategic OEM relationships. He has extensive experience working in optics and photonics for the medical diagnostic and analytical instrumentation market while with companies like PerkinElmer and Semrock (now Idex). 1) Where did you first hear about Nicoya? I was researching optical based bio-medical technology companies. I found Nicoya through research with SPIE’s list of members and exhibitors and made a connection with Ryan Denomme via a shared contact in LinkedIn. 2) What made you interested in Nicoya? I’m also a follower and believer of Steve Blank and Eric Reis in the “Lean Start-up” model. With Ryan and Nicoya gaining Steve’s stamp of approval and taking top honors in the Communitech REV pitch night I was immediately interested in Nicoya. 3) Due to the nature of a biotechnology company, it can take years before we become a global brand. What excites you about the potential for Nicoya? Nothing is more exciting than growing a start-up or new company with unique technology and product differentiation. Nicoya Lifesciences is not just producing a “me-too” product to compete with or be “just as good as” existing SPR companies like Biacore and other expensive SPR instruments. Nicoya’s mission to expand the available market for SPR beyond traditional reference labs to benchtop is genius. Nicoya is creating an entirely new market for SPR. We are not going after existing markets in large reference labs but have created an entirely new market segment with our affordable OpenSPR platform. We are about 10% of the cost of the large reference lab SPR instruments and our vision is to put an OpenSPR on every lab bench at every research facility in the world. We’ve created a much larger addressable market with tremendous growth potential. 4) Where do you see Nicoya in the next few years? Nicoya is undergoing tremendous growth as we speak…upwards of 20% growth month-to-month. As we gain traction, installations, references and channel and OEM partners, I see Nicoya as a major supplier to the individual bench-top SPR revolution…”an OpenSPR instrument on every bench”. In addition to SPR, Nicoya’s key technology (nano-gold particle sensors) has a large variety of applications in additional bio-medical, point-of-care (POC) medical, blood and chemical analyzers, water safety analysis and environmental instruments and markets. I see Nicoya’s engineers aggressively driving our new product development engine and introducing the next big thing to these high growth markets. 5) What are you looking forward to in the upcoming months as you pursue your role? As mentioned earlier, it is exciting to grow the business and build out our sales channels. After putting together our international pricing and discount strategy and detailed distributor/customer deck telling the story of Nicoya – the core technology, vision, product differentiation and value of OpenSPR – I completed our first Asian tour to Japan, China and Singapore in March to meet with prospective channel partners. We shipped our first demo units to China and have completed basic training, demos and put agreements in place with key partners in Beijing, Shanghai, Japan, Singapore, Indonesia and Thailand. Next month I will be back in Japan for additional training as well as visiting key potential partners in Korea. We demo’d our OpenSPR platform at the Queenstown molecular Biology show in Shanghai last week with excellent feedback and have many new end-user leads to follow-up with as well as China leads developed from recent domestic shows. We have commitments for orders and will be shipping our first demo units to Japan, Singapore and Thailand in the next few weeks/months and are putting together similar marketing and promotion plans in these countries as well with targeted trade shows and customer demos. We will continue with more detailed technical training, customer visits/workshops, trade shows, as well as increase the amount of detailed competitive comparison data (specifications, advantages, etc.) to make available to our channel partners. There is still a lot of work to do. The next focus will be on establishing key partners in North America and Europe. 6) What appealed to your business development side about coming to work here? 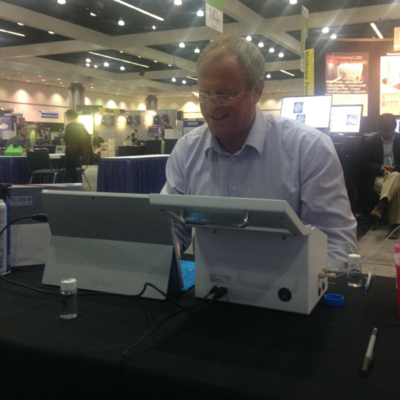 Prior to joining Nicoya, Ryan invited me to participle in one of our trade shows (Peptalk – Protein Week in San Diego) to observe the sales process, customer interaction, demos and overall response to OpenSPR technology. I was amazed at the consistent positive response from researchers and quickly understood the advantages and product differentiation of OpenSPR. I immediately realized the tremendous opportunity to take Nicoya to the next level and expand Nicoya’s business through the development of channel partners to support the OpenSPR platform in both North America and globally. I’ve spent many years developing and growing new businesses in Asia and Europe for PerkinElmer and am applying this experience to my work with Nicoya. 7) Have you had a chance to talk to any Nicoya customers yet? Yes, I’ve spoken with many customers at recent trade shows (PepTalk, BioPhysical Society and Pittcon) as well as participated in product demo’s at two major universities – UCLA and Cal State University Northridge. In each case, researchers are not only impressed with the price point, but specifically the performance of the OpenSPR platform in the simplicity, ease and speed of gathering key kinetic data on protein and molecular binding interactions. The most interesting interaction was at UCLA we met with the head of the biology lab and the head of the academic teaching curriculum. After a 3 hour demo and barrage of detailed questions about OpenSPR, their response was extremely positive and they planned to acquire multiple OpenSPR units, one for the research lab and one or two to incorporate into the teaching curriculum for both undergraduate and graduate students to gain a better understand of molecular interactions and binding kinetics. 8) As the relationship developed, when did the prospect of you working with Nicoya come up? The single most important thing in either hiring a new employee or joining a company is the human element, compatibility, shared values, etc.. Can I work with this person/company/environment. So after 3-4 days working with Ryan and Tijana at the Peptalk show in San Diego followed by a nice dinner, we agreed there might be a “fit”. So Ryan and I put together a 30-60-90 deliverable plan for business development activities as well as a longer-term agreement that he took to the board for approval. The board approved our proposal. I joined Nicoya the next day. 9) One of the interesting observation is your proven track record on building partners with international distributors, that its not just about seeking partners, but that you build long lasting fruitful relationships. Can you expand on how you have managed to do that? Yes, sure. So much of it is about relationship and mutual respect. As well as taking a keen interest in the person, company and local culture and values. Beyond the human element, providing continuous support, periodic visits, technical training, customer visits and support for regional trade shows is key. Also providing good marketing materials and leads from North American trade shows. Another key aspect is the willingness to work together to make business happen. A “can-do” attitude. Not to just provide a price list and discount structure, but to encourage the distributor to bring every opportunity to Nicoya so we work together to find a solution for each end customer. This goes along way in developing the relationship. At times, to make deals happen both parties will need to be flexible and reduce the amount of margin in the business. Flexibly, understanding and truly caring about the distributors business is the key. 10) What do you think will be your biggest challenge in the next 8-12 months? One of our biggest challenges is to educate the masses about OpenSPR. Because SPR has never been affordable in the past, we need to educate researchers on how/why we can provide reference quality, lab quality data and instruments at such an affordable price point. There will be a lot of sales training, technical training and strategy training needed with our channel partners. Customer visits, technical workshops, trade show events, etc.. as well as MARCOM to get the word out. 11) Although you live in CA, you had a history with Kitchener-Waterloo before meeting Nicoya. Tell us about that. Yes, sure. I spent many years working with Electrohome in Kitchener who became Christie Digital. We developed the world’s first xenon DLP large venue and cinema projectors (illuminators, optical systems, cooling systems, etc.) that have become the industry standard for large venue (command control rooms, rock n roll concerts) and cinema projection. We helped Christie grow from a small company to a global powerhouse in the projection market. A similar story with IMAX. I started working with IMAX when they were almost bankrupt with their 70mm film projection systems for museums and planetariums. We started work on a new optical projection system that would enable IMAX to convert Hollywood mainstream movies to a format (both film and digital) that could be projected to their large format auditoriums (>30 meter screens) with ample lumens and brightness necessary to meet Hollywood industry standards. Today IMAX is continuing its explosive growth word-wide and now even moving into IMAX branded high-end home theatres. I have some very fond memories of my days in Kitchener and Waterloo and a great deal of respect for Canada in general. I also spent a lot of time in the major motion picture film set lighting business in Toronto and Vancouver. 12) That sounds awesome – Nicoya’s new office is actually in the old Electrohome factory in Kitchener, how sweet is that! Although you haven’t met everyone at Nicoya, yet, what is your initial impression of the team and culture? I love the people and culture at Nicoya. I feel like I know everyone so well from observing and participating in the interactions on Slack…what a great communication tool! It is so refreshing to be with a young start-up company of talented, energetic and committed professionals. Everyone has a single goal, which is to grow Nicoya. No politics, nothing to get in the way of us all doing our job and doing our best each and every day. I’ve been working closely with Ryan and Tijana at multiple trade shows and customer demos and have the highest respect for their technical knowledge and customer interactions. Marwan is doing a great job with MARCOM, Lauren is a fantastic new addition to the sales team taking on much of Tijana’s work load and Shawn & John are doing a great job of getting product out the door! Everyone has a positive “can-do” attitude and are a committed team work together to get the job done.